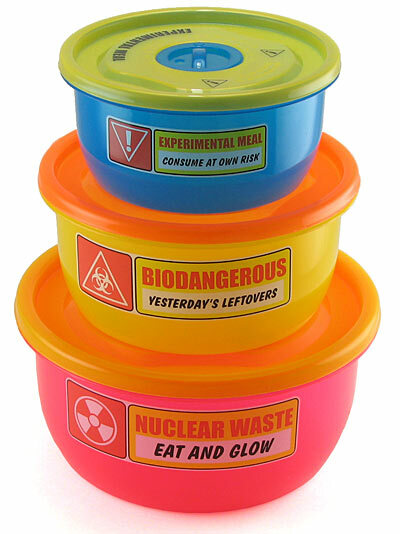 ThinkGeek is selling an awesome set of Atomic Food Containers to help you quarantine your experimental leftovers, while reducing their half-life. You’ll get three containers of different size (400ml, 600ml, and 1000ml) which each nestle into each other for easy storage. Also, each top has a dial so you can set the date you put the container into the cold wasteland of your office fridge. That way, you will know how old the hairy pasta is, and won’t have to guess. Each dial also has a special setting called “vent” which opens up a little vent to vent ventable gasses (just like our underpants, but that’s a story for another time). Buy them now and safeguard your lunch for years to come.